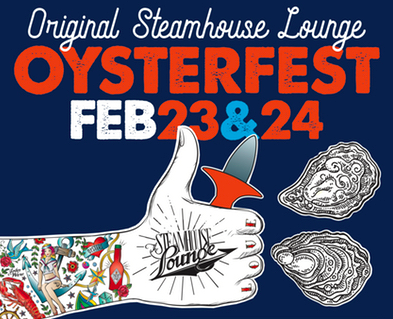 Atlanta’s original Oysterfest returns to Steamhouse Lounge with its 32nd annual celebration. Back at its new location, the city’s biggest street party will feature two days of fresh roasted oysters, a full bar, live local bands, and more! Saturday & Sunday | 11:00 a.m. – 7:00 p.m. Event Entrance at Peachtree St & 12th St. The Oysterfest will offer a full weekend of live music, ice cold beer, fresh roasted oysters, and endless delicious seafood from Atlanta’s favorite local restaurants! Nine of Atlanta’s favorite bands join together for an extraordinary lineup throughout the weekend as guests enjoy heaping buckets of oysters and warm up with Steamhouse Lounge’s legendary lobster bisque. Sister restaurants Fontaine’s Oyster House, Highland Tap, and Vickery’s Glenwood Park will also be on site serving up more local favorites! The Steamhouse Lounge Oysterfest proudly benefits The Giving Kitchen, a nonprofit that provides emergency assistance to restaurant workers through financial support and a network of community resources. Attendees are encouraged to take MARTA, located of 10th Street within walking distance of Steamhouse lounge. The event has become bigger than ever each year, so get your tickets soon! More information on the 2019 Atlanta Steamhouse Lounge Oysterfest.